Tracy Hahn-Burkett has written everything from speeches for a U.S. senator to bus notes for her eighth-grade son. A former congressional staffer, U.S. Department of Justice lawyer and public policy advocate for civil rights, civil liberties and public education, Tracy traded suits for blue jeans and fleece when she moved to New Hampshire with her husband and two children. She writes the adoption and parenting blog, UnchartedParent, and has published dozens of essays, articles and reviews. Tracy is currently revising her first novel. Her website is TracyHahnBurkett.com. To TK or Not to TK? Trying to solve a problem in your manuscript and you just can’t figure it out? Just say you don’t care and move on to something else. Yes, really. Stay with me on this one. Let’s say you’ve been working on a problem in your manuscript for hours, days, months, or a lifetime in dog years. You’re trying to write a new piece of it, or you’re trying to solve an old problem in a new way, or you’re working on any scene that requires some creativity on your part. But you’re tired. It’s draft 37 and you’re burned out. You don’t really care how the love interest dies anymore; you just know he needs to be dead in a way that gets to the next plot point and isn’t inconsistent with three other conditions already set up in the rest of the story. Frankly, if you could make him appear to you in the flesh for a moment, you’d hone one of your chewed-up pencils to a super-sharp point and just do the deed yourself. That would feel so good right now. But that’s not how this works. Now, you’re seasoned enough to know that you can’t wait for your muse to show up before you start to write, so you sit down in your chair, lift your fingers to the keyboard, but…nothing. You can’t figure out the problem. You eat chocolate, and…nothing. You drink copious amounts of coffee. Nothing (except an urgent need to pee). You stare out the window, walk the dog, clean the house… All the usual prescriptions for jogging a writer’s brain add up to you being no closer to accessing the necessary creativity than you were at the beginning of this effort. So give up. Turn your attention to writing something else. That title doesn’t appear to make much sense, does it? You might be thinking, do you even know what those words mean? One is either a plotter or a pantser. If you’re a plotter, you outline. You like to know where you’re going before you set out on your novel’s journey. You may choose to turn right where your outline indicates you will turn left, but that will be a conscious diversion. Order. You must have order. Pantsers, on the other hand, thrive on spontaneity and the unknown. If you’re a pantser, you just get in the car and drive. You introduce yourself to your characters and let them navigate; you allow yourself to become their instrument. Outlines are like nasal-voiced GPS programs constantly chirping reprimands at you each time you deviate from the pre-approved route. SHUT UP, they make you want to shout. Don’t bother me with directions. I will feel where I want to go. Me? I’m a pantser. When I write, I always hope to find myself in The Zone, that place composed of buzz and bliss where I forget I’m typing and the words surprise me as they appear on the page, outcome unknown. What do you mean it’s 5:00? Wasn’t it just lunchtime? Whoa, did Sage just drop the key to the whole story in her admonishment to her sister? I didn’t know she was going to do that. Did Michael just die in that accident? Where did that come from? That’s not where I thought this was going, but it’s great. I’m going to follow this trail and see where it takes me. I may sketch out a few guideposts in advance, maybe identify some oncoming trouble points, but overall, this is how I draft new material. When I complete a draft, I follow the advice of wise author and teacher Jenna Blum: I write a chapter-and-scene outline of the completed manuscript. Anybody else having a focus problem these days? Silly question. Of course you are. News. It doesn’t even matter where you stand, which side you’re on, or Russia what you believe. The news has captured health care just about everyone’s interest, and for most of us, the climate change ability to concentrate on what we’re writing requires Herculean effort. Because subpoena when the future of our country is at stake, and news is sometimes breaking FBI at the rate of a story every five minutes, most of us, understandably, have discovered NATO we can’t look away. (And let’s not even Trump begin to talk about the additional alcohol and caffeine crazy we’re consuming, the stress eating, budget the lost hours of internet trolls sleep…) Sorry, what was I saying? It’s been a whole paragraph. I had to go check Twitter. Seriously, let’s talk about focus. Often a problem when we’re bogged down in the clumsy middle of a book, many of us are now experiencing a different sort of distractibility stemming from stress and the fact that we’re living through a more plot-twisty story than anything any of us could have dreamt up. (And one that would have been rejected by almost all editors for its lack of plausibility.) What’s more, unlike the stories we write, this story potentially carries terrifying, generation or longer real-world consequences. It’s the ultimate page-turner. So how do we pull ourselves away from this reality and focus on the worlds we’re supposed to be creating? The first part of the answer is that you don’t pull away. You accept that you’re going to cede some of your productivity to the news and maybe even to activism, if you’re so inclined. But you’re probably more interested in part two of the answer—the one that gets you back to your writing. Let writing be your refuge. This constant, high-stress vigilance is exhausting. It’s not where most writers feel comfortable. So no matter how compelling that big world story may be, find a way back to that place of your own creation. Those first few moments in front of the blank page may feel strained, but the people in your fictional world are going to make sense to you in a way the people in the news don’t. Besides, won’t it be a relief to spend time on a regular basis with people whose behavior you can control—at least most of the time? What a great de-stressor, even if you end up not keeping everything you write. Third, I’m going to share a stunningly simple tool I’ve found works to keep me focused and motivated when writing through the cumbersome sections of my manuscript. Conveniently, it’s also helping these days to bring me back to the page when I feel like my brain is so immersed in the global news vortex I might never be able to retrieve it. At the beginning of each full draft*, I write on a sticky note a few simple mantras I intend to apply specifically to that draft and place the note where I can see it when I’m working. These mantras can be basic writing precepts, or they might mean nothing to anyone but me. It doesn’t matter so long as they function instantly to direct my attention back to the specific goals I’ve set for each draft of my book. Let’s say I’m writing a novel. Heck, let’s say I’m rewriting it. And let’s say this process is taking me an ungodly long time. How long? Let’s not get bogged down in details. This is all theoretical, anyway. I’m hypothesizing for a friend. Why, fellow unpublished novelist, might this rewrite be taking so long? There are so many reasons: kids, home, work, aging parents, democracy, volunteering in your community, etc. If you want to publish, yes, you need commitment. But you also can’t ignore the rest of your world. Throw in a few life crises, and the process of writing a novel can start to feel like it contains more chapters than the novel itself. Raising a kid? That only takes eighteen years. But a novel is forever. So what do you do when you feel like every writer you know has finished her seven-book series while you’re still struggling with your debut (or maybe your second or third book)? First, stop beating yourself up. It’s okay. Second, recognize that this abundance of time is an opportunity, especially if you’re unpublished. If you don’t have an agent and publisher tapping their fingers on their desks, expecting you to meet a contractual deadline, then use this time to work on your craft and get that novel right. If all goes well, you may not have this kind of time in the future. Third, be prepared. If you’re traveling the long road to finishing a book, you may run into a specific set of problems, one or more of which undoubtedly involve you questioning your own sanity. Let’s examine some of these potential anti-speed traps, and see if there’s anything we can do about them. You’ve come to a tricky plot point in the middle of your manuscript, and the problem is exacerbated because you can’t give it your undivided attention. Here’s the trap: you’ll solve this problem. Then you’ll solve it again. And again. In fact, you’ll come up with so many solutions to this problem and have so much time to consider each one while you’re tending to your other obligations that you’ll decide each solution seems too contrived to be usable. If it’s not contrived, it’s too obvious, as evidenced by the fact that you thought of it. This is true even if in your literary historical novel set during the American Revolution, it occurs to you that aliens from the Vega star system could thwart the British before they capture the young Patriot by guiding said Patriot to the cache of laser-powered muskets. Duh. Anyone would see that coming. Last month, team Hamilton released a book about the Broadway show/mega cultural phenomenon, written by the show’s creator, Lin-Manuel Miranda, and Jeremy McCarter, a cultural critic and theater artist who has been involved with the show since its beginning. The book consists of the entire libretto, accompanied by photographs, annotations by Miranda and essays about the show’s development. I opened the book intending to read it as a fan,** but before long I realized I was reading a class and case study in writing. And while Hamilton is musical theater, many of the lessons scattered throughout the book apply just as readily to writing a novel as they do to writing a musical. You have to understand your characters’ motivations. McCarter writes, “for any treatment of the duel [in which Burr kills Hamilton] to be dramatically satisfying, Burr had to seem like a worthy adversary. That means they needed to understand Burr and his motivations. . . .” Your characters can’t just act. We need to understand why characters act the way they do. What makes Burr who he is at this climax of the story? Without motivation, he’s just a puppet, a robot. His humanity lies in the why, not the what. How much do you TK? That’s the question. Mary inclined her head toward the parlor, letting him know they were not alone. The [TK-appropriate rank soldier] hesitated, then turned and walked outside. Mary checked the pocket of her skirt again to make sure the [TK-medium for message] was still there, then followed him onto the porch. You know where you’re heading with the story and what your characters are doing, but you haven’t yet worked out some of the details. So you drop a few TKs and keep going. Do you TK when you write? Or does writing with TKs make you feel like you’re preparing a savory recipe like Chicken with Forty Cloves of Garlic but omitting the garlic, the wine, the herbs and anything else that contains any flavor? In which case, why bother making the recipe at all? This post isn’t so much about writing as it is about being a writer. Or, to be more precise, it’s about simultaneously being a writer and a citizen of the troubled world in which we live. Here’s the question: should the writer of fiction also publicly discuss politics and related controversial topics? The prevailing wisdom says no. As writers in the twenty-first century, most of us necessarily spend nearly as much time growing and nurturing our platforms as we do writing the books and shorter works those platforms exist to promote. It doesn’t make sense to work as hard as we do to build our platforms only to weaken them by broadcasting our political views. When it comes to political matters, everyone’s got an opinion, and everyone is convinced he’s right. So unless you make your living as a political writer, it’s simply not worth the risk of offending half of the potential readers out there by expressing political opinions we might just as easily keep to ourselves. But maybe the prevailing wisdom isn’t always right. I can think of two reasons for a writer to discuss politics with care, and they go hand-in-hand. First, she believes the person she is presenting via her platform is not genuine because the political side of her is a key part of who she is. Second, she believes she has an obligation as a human being to speak up where she sees injustice. In these cases, perhaps it’s better not to remain silent. I’m going to wear a different hat today than I usually do. (You can’t see me, but I’m taking off my writer’s hat—the one with the red-pencil holder and the built-in chocolate and coffee dispensers—and putting on another hat right now.) I’ve just completed a two-year stint as a part-time bookseller at a lovely independent bookstore. Aside from the obvious bliss of having spent two years surrounded by books and people who love them, I also came away with a new perspective regarding authors and how they approach their close allies, bookstores. I found myself with an excellent opportunity to study both the good and the bad, and I want to share with you what I learned. Really, everything I’m going to say boils down to one thing: always be professional. This rule applies to all authors, of course. However, I would be remiss if I didn’t share my observation that the majority of the authors I met who needed a helping hand in this area were self-published authors who hadn’t made the necessary effort to understand the business they were entering. *Understand that the bookseller wants to carry your book. For some, this might be the most surprising point of all. You and the bookseller are in the same business: convincing the public that it should be reading great books (instead of playing Trivia Crack, taking selfies and goodness knows what else). 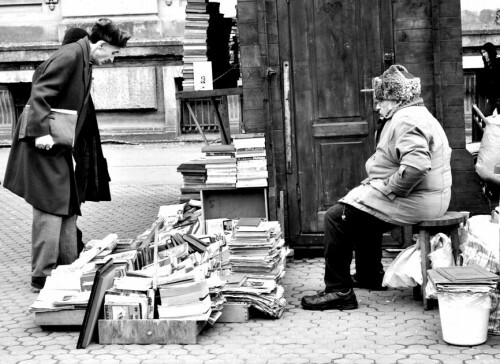 If the bookseller has a quality product to carry and market, her job is easier. So if you, the author, can approach the bookstore with a superior product–your book–and present it in a manner that demonstrates you understand the business aspect of books as well, you’ll be well on your way to establishing a mutually beneficial and lasting relationship. Image courtesy IMMages via DeviantArt.com. One of the most valuable methods of research for writing a novel can be the in-person interview. Experts in a particular field or people who have personally experienced something related to your story can not only answer questions put directly to them, they can provide experiential, sensory and other details it might be impossible to gain any other way. When I talk to other writers about conducting interviews as part of their research, many express trepidation or outright intimidation at the prospect. This is understandable. First of all, many of us in this profession are introverts, and asking forthright, sometimes intimate questions of people we’ve just met falls outside of our comfort zone. 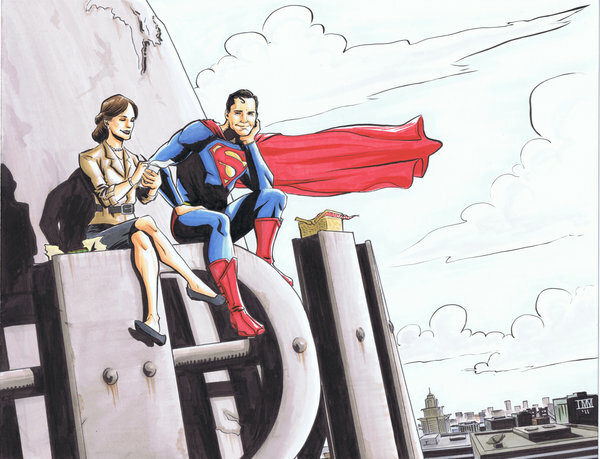 Second, the people we seek to interview are often busy professionals, sometimes holding positions of high status. How can we approach them with any expectation of receiving their time, particularly if we’re unpublished, unknown writers? The answer is to choose carefully the people you approach and to act professionally and with confidence–even if it’s an act at first. Don’t know where to start? No problem. Here is an 18-step process (yes, 18!) for interviewing people for your novel. Do your pre-research. Read. Read more. Read history, memoir, articles, sometimes fiction. Watch documentaries. Learn everything you can via various media. Let’s say you’re writing about a murder investigation. You won’t want to open an interview with the detective assigned to a murder case with, “So, what’s it like being a detective?” This vague question is not a valuable use of the detective’s time, and she won’t appreciate it. Learn everything you can on your own first. Draw up your list of target interviewees. Decide how many and which people you need, and prioritize them. If you need to speak to a general surgeon, begin there. You will probably find someone without too much difficulty. If you need to speak to someone who was a member of Solidarity in Poland in the early ‘80s and was detained without charge during the imposition of martial law, you’re probably going to have a tougher time. But don’t let that challenge dissuade you (see next point). Be a detective. If your targets are hard to find (the Polish example), sensitive (relatives of people who have died or survivors of tragedies), or people not inclined to talk to the public (people who work with private or secret information, such as some psychiatrists and government officials), you may need to dig quite deep. Comb through every network you can think of: alumni lists, civic organizations, fellow school parents who may know people. Write a professionally worded email to each person you want to interview. Introduce yourself and your project, offering just enough detail to catch your potential interviewee’s interest and show him how he is relevant. Tell him specifically how he might provide critical information for your book. Don’t go on at length; you’re also showing him that you understand his time is limited. Include a few points from your own biography; keep it to a sentence or two. End with any pertinent travel details—i.e., you’re going to be in his city the week of June 1—and an expression of how grateful you would be if he could meet with you during your time frame. Tell him you will follow up in a week with a phone call, but also provide your phone number and email address in case he’d prefer to get back to you. In other words, the Un-Con will be Un-Conventional. We’ll spend a week sharpening our literal and metaphoric pencils and deepening our writing skills. That might mean finally understanding a specific element like voice, or acquiring new writing-life skills, like strategies for how to write through difficult times. Or perhaps we’ll just soak up every word Donald Maass says, regardless of topic. No matter our approach, we should come away from Salem next weekend better writers than we are today—assuming we apply what we’ve learned. But what if you can’t make it to the Un-Con in person? Don’t worry; you can Un-Con on your own. First, you can follow what’s happening at the conference in real time on Twitter by following the hashtag #WUUnCon throughout the week. 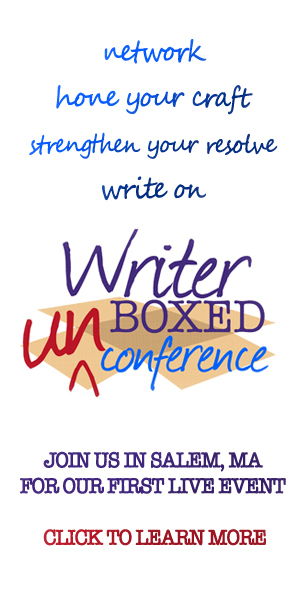 Second, we’ll try to post recaps and materials from the conference here at Writer Unboxed later in the year. It’s not often that one hears a statement that is both undeniably true and contradictory to the nature of everything we do. But at a reception this past spring, I heard such a statement. A small group of us were discussing the life of the author in whose honor the reception was being held. This author, who had written both a memoir and a novel, had been separated from his family at the age of twelve and forced to become a child soldier in Sierra Leone. “My son is twelve,” I said. “I try to think of my own son in those shoes…” My voice trailed off as I began to conjure images of my American, middle-class, twelve-year-old son suddenly, violently, torn from me and the rest of our family, forced to survive in lawlessness, impelled to run for his life, left with no choice but to kill and to maim. The effort quickly formed a universe of horrific thoughts in my head that immediately made me want to leave the reception, go home to my son and hold him tightly to me. “You can’t,” said a man in the group, taking advantage of my external silence. True enough. I can’t. No one can know those acts, that life, for certain, without having been there. I would never presume to write that author’s story. I can imagine something else. I can imagine another person, say, a twelve-year-old child who suffers a terrible loss—maybe she loses her parents in a car crash. Maybe her sister was in the wrong place at the wrong time in Gaza this month. Maybe her brother was a heroin addict and she herself is teetering on the brink, finding herself between “friends” and opportunities to take her life in directions she doesn’t even understand. Or maybe I am fascinated by an ancient culture I’ve heard about in some place I traveled, a native Central American people, and I’m willing to put in the effort to learn about that culture and develop characters. A young protagonist, perhaps, pushed by a traumatic event into a non-traditional role in her culture, challenged in her need to develop into something she’s not. I’m starting to see her already. I write best in big chunks of time. I need four or five hours together to become fully immersed in the world where my characters live. I don’t know why I work this way, but I do. It’s the kind of fiction writer I am. It’s unfortunate, then, that my life right now won’t permit me to write this way. I have a couple of part-time jobs. I have a couple of kids, ages twelve and nine (otherwise known as the “drive me” years). One parent recently passed away and left me with probably a year’s worth of responsibilities, and my other parent requires time and attention. I also have pets, doctors’ appointments, things that break and need fixing, meals that need to be cooked, shopping that needs to get done, a house that needs to be cleaned (okay, so I don’t do a lot of that)–you know, the stuff we all have. All of this means that my schedule is packed from the moment I awake until the moment I go to sleep. And it frequently changes with little notice. In other words, the four-to-five-hour block of writing time just does not happen. Make appointments with my characters. Writer Catherine Elcik suggested blocking out appointments with my characters on my calendar just as I would with real people. I use iCal on my laptop and iPhone, and now anyone who looks can see I’ve frequently got time marked off for “meetings” with people who just happen to share my primary characters’ names. I also print the calendar out each week and tape it to my desk. I can’t say I always make every appointment, but having my characters visibly waiting for me, tapping their toes right where I can see them, has kept me more on target than in the past. When life events forced me to stop writing for a while (see below), I found I really missed this structure and it was the first thing I brought back when I returned to the keyboard.